Ghost Bikes Review: What To Think Of This German Manufacturer? If you are from the USA, you might not have heard about Ghost Bikes at all or you might have only heard about them recently for the first time. However, if you are from Europe, then you definitely know about this well-established and renowned German brand. Ghost makes bikes that fit all types of riders, including fully suspended, hardtail, road bikes, trekking, e-bikes, and so on. They also make bikes both for women and for men, with corresponding geometries. Today, I’ve decided to provide you with a deeper look at the brand and write an overview of what they offer. We won’t cover all of their series but you’ll be able to learn about all of the most popular ones. Ghost bikes have a very interesting history and interesting beginnings, so it would be a shame not to say a couple of words about it. Ghost was established back in 1993 by two friends from a small German town Waldsassen, called Uwe Kalliwoda and Klaus Möhald. The two friends opened their first bike shop in 1992, operating from their garage, selling and servicing bikes to their college colleagues. In 1993 the Ghost brand was born, when they produced their first bicycle – a 9.9kg bike which was a huge success, in part because of its competitive price. From there on, the duo kept growing and improving their bikes and facilities. In the meantime, they opened their own aluminum and carbon companies as well, so their frames started being produced in-house as well. This gave them more authenticity and raised the quality by a lot. Today, Ghost bikes produce high-quality bicycles both for professional and for recreational riders and sponsor some of the most successful athletes in the sport. Unlike many other companies, Ghost bikes still operate mainly from Waldsassen. More than 70% of their production comes from this Bavarian town. However, the company also has business locations in Spain, the Netherlands, China, Korea, and Taiwan. Ghost bikes have many road, trekking, and urban models but MTB models is where this brand really excels. On the official website, Ghost mountain bikes are divided into two sections: Fully Suspended and Hardtail bikes. So, let’s check out the different models and help you make up your mind when buying. Ghost Riot is the high-end full-suspension mountain bike series from this manufacturer. At the moment, there is only one bike in this group, the Riot 8.7 UC and it sells for around $6000. However, it offers a lot, so the price is justified. The UC mark stands for ‘Ultralightweight Carbon,’ which the frame and fork are completely made from. This keeps the weight way down and makes the bike stiff and responsive, especially when cornering and going down. Both the rear and the front suspension is supplied by Cane Creek. The fork is a Cane Creek Helm, with stunning 150mm of travel. The rear suspension is a Cane Creek Inline Coil CS with 130mm of travel. This will be plenty of shock absorption both for enthusiasts and for pros who want to bite into some seriously rough terrain. 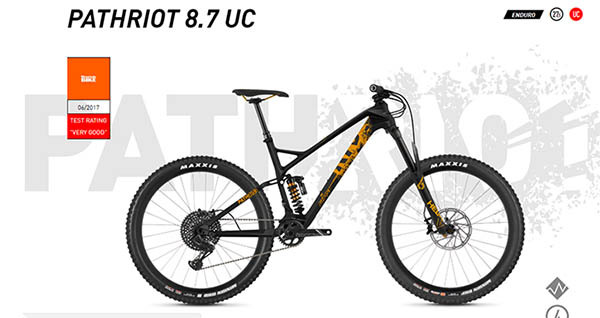 Components and shifting-wise, the Riot 8.7 UC has a lot going on for it. It has 1×12 gears which is not something we see that often. The rear derailleur is a newly-developed SRAM X01 Eagle 12-S, specially designed for racing performance. The cassette is a 10-50T, while the crankset has 34T, so this bike can both tackle very steep hills and go dauntingly fast on the flats and downhills. Of course, the brakes are hydraulic disks, SRAM Guide RSC 4/4 Piston, to be more specific, with 200/180mm rotors. You can also be excited about the proven Maxxis Minion 27.5×2.3 tires both on the front and the back wheel, which make no compromises when it comes to performance. The only doubt when it comes to this bike is the price but if you have the money to spend, it is definitely worth it. 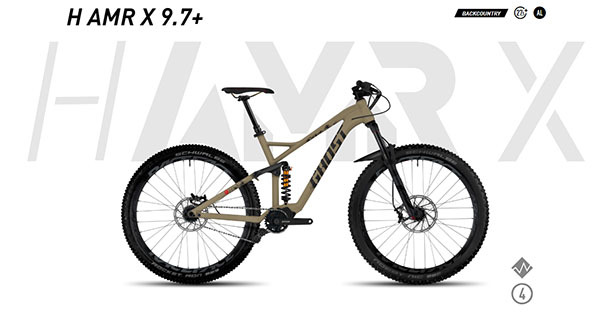 If you are looking to start racing or you want to upgrade your MTB racing bike that you have now, the Riot 8.7 UC should definitely be on your list. Ghost Parthriot is another high-end full-suspension MTB series from Ghost, again with only one bike on offer at the moment. This is the Ghost Pathriot 8.7 UC, which has a lot in common with the Riot series but takes the edge over it in some aspects as well. The Ghost Pathriot has the same UC frame like the Riot model, which looks aggressive and very slick and keeps the weight down at around 14kg. If you are looking for superior suspension, then this is the bike you should be looking for. The fork is a Cane Creek Helm with 170mm of travel and the rear suspension is a Cane Creek Double Barrel Coil CS with 150mm of travel. The rear derailleur is the standard SRAM X01 Eagle 12-S, which is put on most Ghost MTB’s in this range. The brakes are the same as the ones on the Riot model. They offer lots of stopping power, regardless of the terrain and weather you are riding in. The wheels and tires on the Ghost Patriot are superior compared to their other models and allow you to ride aggressively on the downhills with lots of stability and control. Both the front and the rear tire are Maxxis Minion. The front one is a MaxxTerra Exo 27.5×2.5, while the rear one is Exo 27.5×2.4. The difference in tire width allows you to have more control and better grip when cornering because of the wider front tire, while the narrower rear tire allows you to go fast and accelerate quicker. It’s the perfect symbiosis. If you can get over the price of around $6000, this bike is amazing. I can’t really find any downsides to it. It has a unique geometry which some riders are skeptical about without any reasons since it only adds to the overall feel and performance when riding. 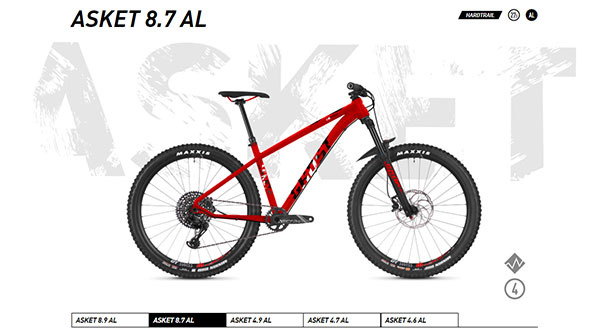 The Ghost SL AMR and AMR X series is the largest one Ghost has when it comes to mountain bikes. There are ten bikes in total, ranging in price between $2,000 and $5,000. The cheaper models have all aluminum components, while the more expensive ones bear an LC mark, which stands for Lightweight Carbon. There are also models in-between which have aluminum frames, with some parts made of carbon which keep the weight down. When going through the SL AMR series, you can choose between 27.5” wheels and 29ers, depending on what your preferences and the intended use for the bike are. The SL AMR is an “all mountain” line and all models are fully suspended. Depending on the price of the model, you can get either Rock Shox or SR Suntour suspension with 140-150mm of travel. The derailleurs also differ from one price range to another, so you can expect to find the SRAM Eagle 12-S on more expensive models or Shimano SLX on the more affordable ones. The same goes for brakes, which are either made by SRAM or by Magura. They are hydraulic discs on all models, with rotors of 180mm on average. Generally, the whole SL AMR series is great for anyone who is just starting out on the trail and getting to know mountain biking more seriously. The more expensive models are suitable for MTB enthusiasts with lots of experience and a lot of miles in their pedals. Of course, some models have disadvantages because the price had to be kept down – you are only getting as much as you pay for. However, online reviews of riders who bought these bikes are pretty positive in general, so you should be content as well if you buy it. The Ghost H AMR has two models right now, the H AMR X 9.7+ and the H AMR 6.7+. Both are backcountry models with aluminum frames, with prices of $7,000 and $2,500, respectively. To mention the most exciting part right away (and explain the $7,000 price), the more expensive H AMR X 9.7+ model has a Pinion gearing system, which is located inside the bottom bracket. If you haven’t heard about it, the Pinion gearing system is the newest tech when it comes to bike transmission which has many benefits. All of the gearing mechanics are located inside a closed casing, so the maintenance is very easy and almost inexistent. Gear changing is smooth and instantaneous and there’s also no need for tampering with the shifting all the time. The chance of messing up your derailleur in a fall does not exist anymore. The cheaper H AMR 6.7+ model cannot boast such technological advancement but is still a great and affordable backcountry bike which you can safely take on a long trip. 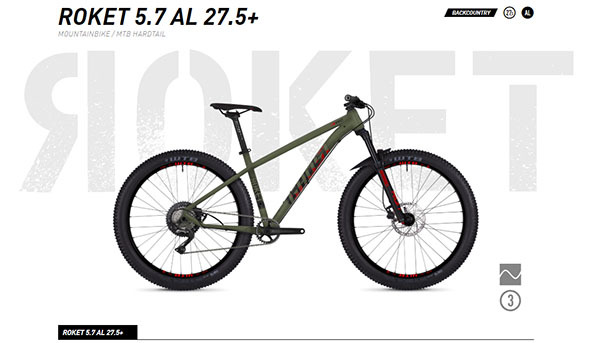 The cheaper model has an SR Suntour AION 140mm fork and a Rock Shox Deluxe 140mm rear suspension. The more expensive one offers a smoother ride with a Rock Shox Pike 140mm Boost fork and a Cane Creek DB Coil 140mm rear shock. If you go for the more expensive model, you will also pay for a hub dynamo and a USB charging port on the handlebar for easy access. Now you can easily charge your GPS, smartphone, or bike lights with the power of your legs. So, if you’re on the lookout for a superb backcountry bike to power your adventures, the H AMR 6.7 is a safe choice. However, if you want to go bold, and you have the cash to spare, you won’t go wrong with the H AMR X 9.7+ model either. We have arrived at Ghost’s FR AMR Enduro series, which many riders find to be the most exciting mountain bikes. In total, there are three models in this series – named 4.7 ; 6.7, and 8.7. All three models are built around lightweight and affordable aluminum frames, so the cheapest FR AMR model is the 4.7 AL – around $2,500. If you want to go higher and get more out of your bike, you can get the 8.7 AL for around $4,500. Let’s see what it is you get for your money. Each of the three bikes has the same Enduro geometry which will allow you to smash those timed downhills and recover your strength on the uphills due to a good range of 1×12 gears. The cheapest model has a 1×11 gear combination, which is still pretty good for most cycling enthusiasts. 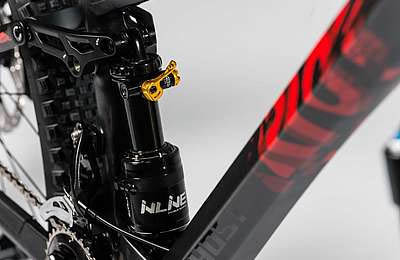 The most expensive model has Cane Creek suspension, the mid-range one uses Fox suspension, while the cheapest one bounces on a combo of SR Suntour front and a Fox rear suspension. The most superior one is definitely the 170mm/165mm Cane Creek but the other two perform really well as well. Starting from the most to the least expensive, the shifting is done by SRAM X01 Eagle 12, SRAM GX Eagle 12, or Shimano SLX 11. However, even though the most affordable model is $2000 cheaper than the most expensive one, Shimano SLX shifting is still a pretty decent choice. The whole FR AMR series has 27.5” tires of different widths, which have proven as the best choice for enduro rides, so the bikes generally feel very stable and offer a big confidence boost when cornering. 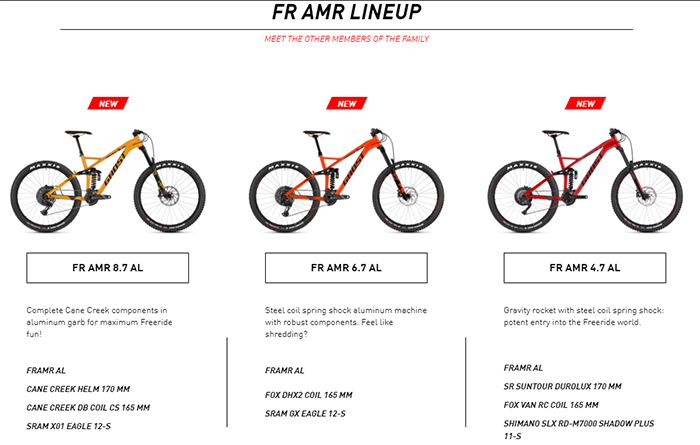 If you are looking for a decent Enduro bike to start racing or just start riding more seriously, you should shortlist at least one of the models from the FR AMR series. The Ghost Kato FS is a line of mid-range trail mountain bikes produced by this German company. At the moment, there are six models displayed on the official website, offering a lot for very little money. Of course, you need to keep in mind that you will not get much more than what you are paying for. All Ghost Kato FS bikes have lightweight aluminum frames and more affordable aluminum suspended forks. Because of this, the weight of the bikes is higher than what we have gotten used to with other high-end Ghost models but it is still low compared to competitors. The average weight is just above the 30 lbs mark. The problem of suspension is solved by either SR Suntour, Fox, or X-fusion on most models, with forks and rear shocks with around 130mm travel. However, most other components are supplied by Shimano, which guarantees quality and durability. The cheaper models have 2×10 gearing and Shimano Deore components. The more expensive ones have 1×11 gearing and Shimano SLX components. The most expensive ones can boast of Shimano XT 1×11 drivetrains, which is pretty much the best you can get from Shimano and raises the value by a lot. The Ghost Kato FS series brakes using Shimano disc brakes, which are mechanical on more affordable models and hydraulic if you are ready to spend more money. Paying more and going for hydraulic disc brakes is definitely worth it both for maintenance and performance. When it comes to tires, all models wear the same Continental X-King 27.5×2.2 which are great for less technical single trails with harder surface and not too much water and mud. If you fell in love with mountain biking on a low-end trail bike and you feel that you have outgrown it technically and that it cannot keep up with your skills anymore, one of the Ghost Kato FS models will be the perfect choice for you. You won’t buy too much bike straight away but it will be enough to support your progress on the trail. Women have a lot to be happy about full-suspension Ghost bikes as well. The Lanao FS line is created especially for them. As the company says – designed by women, for women. They are more affordable aluminum models with prices of around $2,000 and below. There are currently three models available on the official website, with really attractive and feminine color schemes. You can choose between neonred, neonpink, jade, and berry – all of them look amazing against the dominant nightblack color. What’s characteristic for all Lanao FS models are the Shimano components, which differ from one model to another. The less expensive model is fitted with Shimano Deore components, while the more expensive ones have Full XT or a combination of XT and SLX components. Similar to other lines, the cheaper model has a 2×10 drivetrain, while the more expensive ones have a 1×10 drivetrain, which is more efficient and saves plenty of weight. If you’re ready to pay more and suspension is what matters the most for you, you should go for the most expensive model, the 5.7 AL, which will get you Fox Float suspension with 130mm travel on the front and on the back. If you want to save some money, you’ll have to settle with a combination of SR Suntour and XFusion. With fast bikes like these, you’ll also need lots of stopping power, which you get in the form of hydraulic Shimano XT brakes on the 5.7 AL and cheaper Tektro hydraulic discs on the least expensive model – 2.7 AL. One piece of good news is that you won’t have to make compromises with tires since all three models are fitted with Continental X-King PureGrip 27.5×2.2”, which is obviously Ghost’s go-to solution for most mid-range models. So, you need to decide how much bike you want to buy and how much money you are willing to spend. 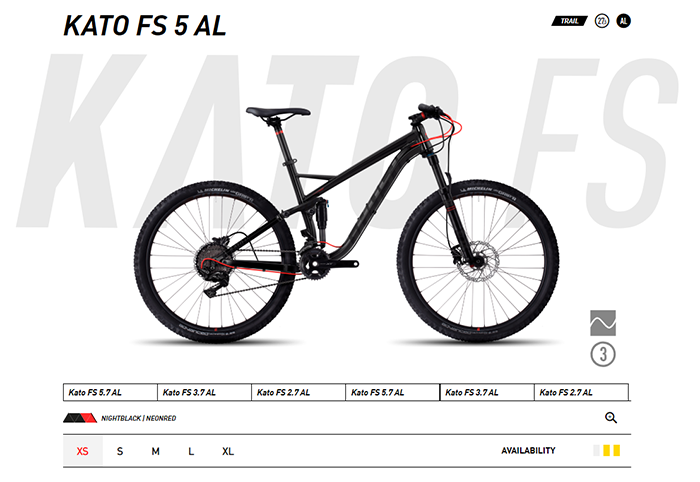 The least expensive Lanao FS model is not nearly as good as the most expensive one but if you are just taking your first steps in mountain biking, it will still meet most of your demands. Full suspension mountain bikes look attractive and perform fabulously but they are not for everyone. If you do not want to invest more than necessary in your bike, you should definitely check out Ghost’s hardtail models. 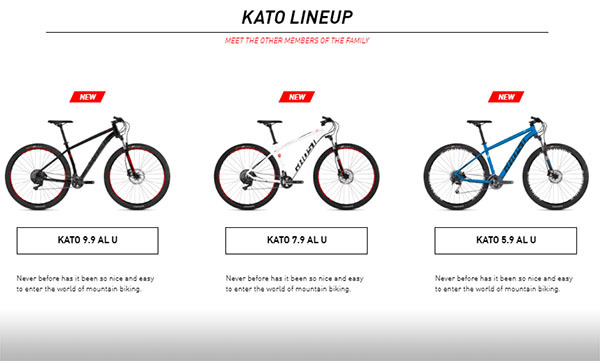 The selection is so vast, that there is the right bike made basically for everyone. This range consists of five lines: Kato, Lector, Asket, Roket, and Lanao. Ghost Kato series is this company’s most plentiful line right now. With the selection of around 30 models (! ), from high mid-range to low-end bikes, it’s hard not to find what you’re looking for. If you’re picky when it comes to design and colors, that won’t be a problem either – these models come in all the colors of the rainbow! So, what is the Kato Series? It’s a line of lightweight and affordable aluminum hardtail bikes that fall within the XC Tour category. Most models are unisex, so you can safely consider them regardless of whether you’re a man or a woman. There are also different wheel sizes available, so you can be picky here as well and choose your preference. There are 20”, 24”, 26”, 27.5”, and 29” models. However, the offer is most bountiful with 27.5” and 29” models. The top model from this line is the Ghost Kato 9.9 AL U, which retails for around $1,500. It’s got an aluminum frame, so the bike weighs around 28 lbs, which is not at all shabby for a mid-range hardtail bike. It’s equipped with a RockShox fork with 100mm of travel and full Shimano XT groupset. This includes both the rear and the front derailleur, shifters, as well as brakes. The brakes are hydraulic discs, which is as good as you can get on any price range. The cheaper models, depending on how much money exactly you are willing to spend, come with lower components. There are some Shimano SLX models, Shimano Deore, and even Shimano Altus and Acera models. These are not very good for serious riders, but for the right person, they will still be the perfect bikes. The individual models of the Ghost Kato Hardtail group might have some disadvantages. However, the whole group itself really has none. It’s tailored to suit riders with different preferences and leaves no one hanging. Take a closer look at the models and pick one if you like what you see. If you liked what Ghost Kato hardtail edition had to offer but you want more, you should check out the Ghost Lector line. This is a group of 21 models of XC Race bikes with light carbon and ultralightweight carbon frames. At the moment, there are 4 UC models, while the rest of them are LC. Moreover, there is only one model with a rigid fork, which is also UC, while the rest of them are suspended. Most of the forks fitter are RockShox with 100mm of travel but the quality of the model and features will differ depending on the price. When it comes to components, the higher-end models are fitted with SRAM components and 1×12 groupsets. Some less expensive models have Shimano SLX, while the least expensive models from this range are fitted with Shimano Deore, which is still a very decent groupset. The prices in the Ghost Lector line range between around $2,000 for the cheapest models and $4,000 for the ultralightweight carbon models. 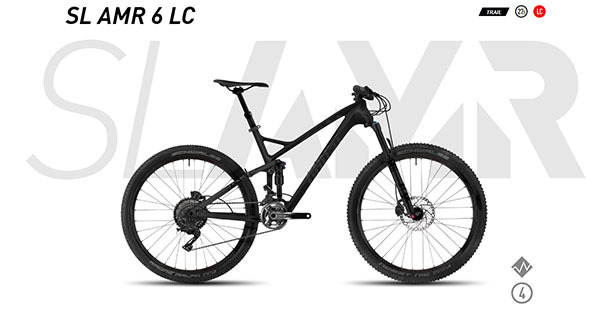 The weight is generally around 10 kg or a bit more, while the UC rigid model, Lector X 8.9 UC, weighs around 9.4 kg. All but two of the models in this range are 29ers, so you do not get to pick a lot when it comes to wheel size. All of the bikes also have hydraulic disc brakes, so that’s a no-brainer as well. Of course, the quality and rotor diameters will differ as the price goes up or down. 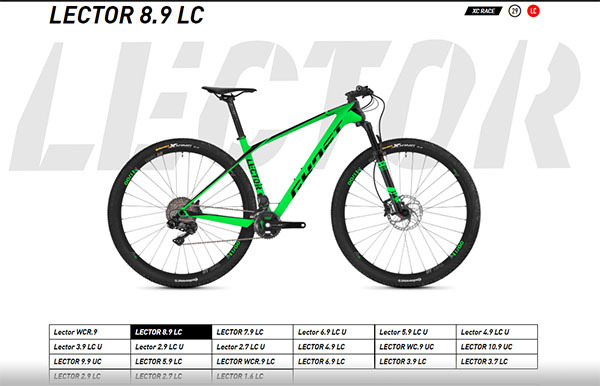 In general, the Ghost Lector range is developed with speed and racing in mind. Compared to the Ghost Kato hardtail, these bikes have a much more aggressive geometry which will put you in a better position to develop high speeds and smash timed courses. So, if you are planning to start XC racing or you want to improve your times, one of these models will surely help you do that. Ghost Asket is a much smaller group of models manufactured by this Bavarian company, intended for a more specific rider demographic. There are three models available at the moment, with wheel size variations, so in total, you can choose between 5 bikes. The price of the most expensive model is around $2,500, the middle one is around $1,500, while the cheapest 26” costs around $1,000. If you decide to go all-in and spend $2,500 on the Asket 8.9 or 8.7, you’ll get a lot for your money. A really lightweight and well-designed frame looks both attractive and offers a comfortable and a confident ride even on the harshest trails. It’s fitted with high-end SRAM Eagle 12-speed groupset and SRAM disc brakes. 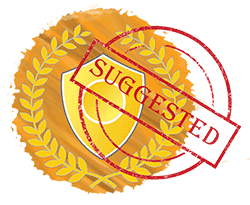 Moreover, it rolls on Maxxis Minion tires, which is as trustworthy as you can get. The mid-price model has a lot in common with the most expensive one, but uses SRAM’s NX 11 groupset, with corresponding shifter and derailleur. It is also fitted with hydraulic disc brakes, so you should not worry about having enough stopping power. The geometry of the two is pretty much the same, so it all depends on how many quality components you want to get and how much weight you want to save. Ghost has thought about beginner riders as well and developed the cheapest model in this range for them. This is the Ghost Asket 4.6, with an aluminum frame and 26” wheels. It comes fully equipped with Shimano Deore equipment, which offers the best ratio between quality and price that you can get right now. Instead of SRAM brakes, you’ll stop using Tektro’s hydraulic discs and you’ll ride on WTB Vigilante tires, instead of on Maxxis Minions. This is a great bike as well but if you want to save money, you will have to sacrifice lots of components. However, if you are a casual rider or if you are just starting to ride trails more seriously, the cheapest model will definitely meet your requirements, if you are ok with the 26” wheels. If not, check out some other Ghost models! Ghost Roket is a premium bike developed for the bold and the adventurous ones! If you have always wanted to go on a long trip to nature but were intimidated by bike maintenance and the reliability of your bike, the Ghost Roket X 8.7+ will take these worries away. The price of this model is probably steep for most people – it’s around $4.700. However, if you are lucky enough, you can get it on sale for much less, so be on the lookout. The Ghost Roket X 8.7 is a tough and sturdy backcountry bike that can take a lot of beating. It comes as a 27.5” model but you can easily fit 29” wheels on it as well without any problems. The biggest high point of this model is the 12-speed Pinion gearing, encased in the bottom bracket. You have seen it also in the Ghost H AMR series and now you see it here as well. 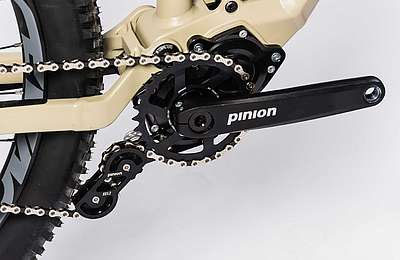 Pinion gearing is an amazing low-maintenance solution for anyone who does not like spending a lot of time getting their hands dirty around the chain and derailleurs. You can take it on a trip around the Alps or the Rockies and not think about it once. 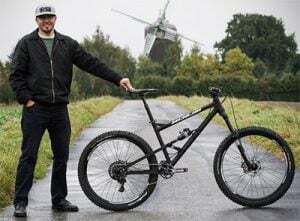 The fact that this is a real adventure bike is proven also by the fact that it has a boost dynamo hub inside the front wheel which produces electricity as you ride. There is a USB charging port fitted on the handlebar, so you can now keep your GPS and your smartphone charged at all times. 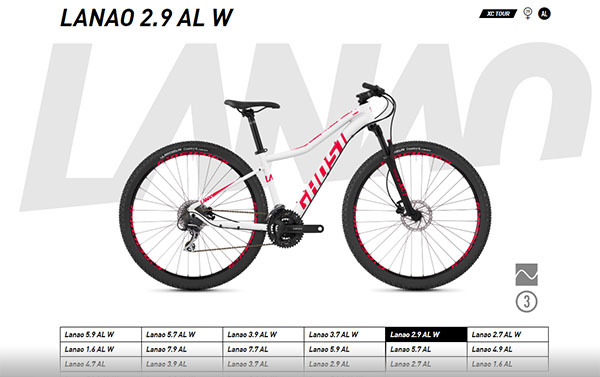 If you are from Europe and decide to buy this model, you’ll also get the AMR Hardtail Bag System. Unfortunately, this deal still does not exist for the USA and Canadian customers. Apart from that, the Ghost Roket X 8.7 can also boast with a Rock Shox Yari RC 130mm fork, Schwalbe tires, and amazing SRAM Guide R brakes. I really can’t see a downside of this bike, except for the price. 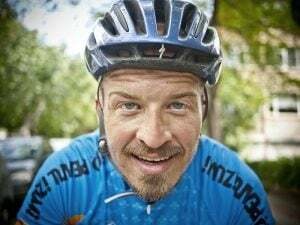 If you are fine with spending that kind of money on a bike – go for it! You will certainly not regret it. The Ghost Lanao hardtail series is a range of affordable aluminum bikes intended for enthusiasts and casual riders. The “W” models are designed for women. There are both mid-range models here and low-end models, so you should be able to find something good for a reasonable amount of money. In total, there are 20 models on offer, all with light and durable aluminum frames. Color-wise and geometry-wise, there are both female and male models. In total, there are 11 models for women, which are both more and less advanced models. All of the bikes have a more comfortable touring geometry and fall within the XC Tour category. You can satisfy your wheel-size preferences as well since there are all wheel sizes within these 20 models. The most expensive models have Shimano XT groupset. More affordable models have Shimano Deore components and there are even Shimano Acera and Altus models which cost far less than $1,000. All but some kids’ models have hydraulic disc brakes. This is extremely important if you are planning to use these bikes for what they are made to do – to tackle rough single tracks and even terrain where there isn’t much road for you to ride on. These cheaper models are not intended for riders who are serious about XC riding and who plan to push their limits. However, if you are unsure about what kind of rider you are and what you like about cycling, one of the Lanao hardtail models will be great. You won’t spend too much money, you’ll make some compromises component-wise but you’ll still get a really good bike to support your efforts. My intention with this review of Ghost bikes was to bring you closer to this amazing German brand and hopefully help you learn more about it. If you are doubtful about the quality and range of Ghost mountain bikes, I am pretty sure that’s not the case anymore. As you can see, there are high-end bikes on offer, as well as mid-range and low-end bikes – so, there’s something for everyone’s pocket. You can also choose between fully suspended and hardtail models, and there are even some rigid models if you want to go ultralightweight! If you are looking for a new bike that will be a conversation starter and get lots of questions asked, definitely consider buying a Ghost bike. The low-end models come with some downsides, as is the case with any low-end models but this is not a problem if they end up in the right hands. So, take a close look at the range, take your time, and find the bike that fits you well!